In the past, Adelaide has been the forgotten city of Australian tourism, often used as a transit stop en route to the Barossa Valley or McLaren Vale, rather than a destination in its own right. But recently the pretty South Australian city is breaking away from its conservative shackles of the past. Adelaide has seen a local explosion of new restaurants, cafes and bars to complement its beautiful city and beaches. Whether you’re looking to soak up the sun at one of Adelaide’s pristine beaches, or to go for a wine tour in the Adelaide hills, Adelaide has a little bit of everything for everyone. Here’s a guide to making the best of 36 hours in Adelaide. 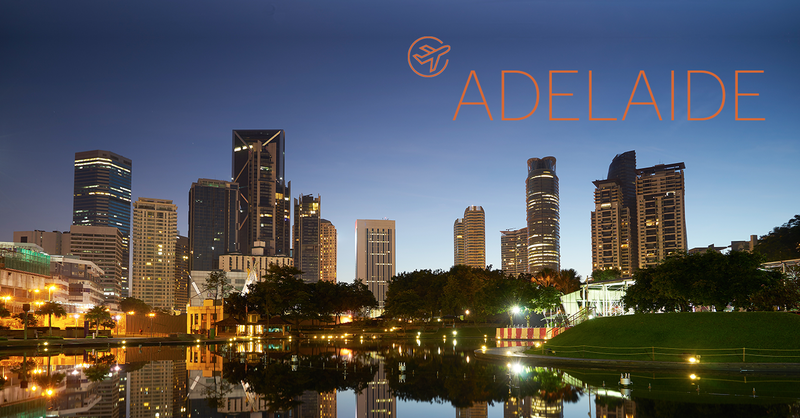 Arrive at Adelaide Airport and take a taxi to the Crowne Plaza Adelaide on Hindmarsh Square (only a 15 minute drive). Alternatively Adelaide Metro offers an express double-decker bus service called Jet Express between the airport and the city. Drop off bags at concierge if your room isn’t ready quite yet. Pick up a free bike at Bike SA on Carrington Street and make your way to the River Torrens for a ride along the beautiful banks of the river. Remember to ride with a helmet – it’s compulsory in Adelaide! Check out the newly revamped Adelaide Oval, Adelaide Convention Centre and the Festival Centre before proceeding to the Linear Trail towards Henley Beach. The 14 kilometre trip should take around 40 minutes and is suitable for all levels of fitness. Ride along the river’s edge and you’ll see plenty of bird life and native flora and fauna. Most tourists flock to Glenelg Beach when visiting Adelaide but Henley Beach is one of the best-kept secrets amongst locals, and for good reason. Whether you are looking to go for a dip, go fishing or just a casual walk along the picturesque wooden jetty, there is plenty to see and do in Henley Beach. Venture to Henley Square and explore some of Henley’s much loved cafes and restaurants. For a bird’s eye view over the ocean, have lunch at Malobo on Henley Square. Here you can feast on baked scamorza cheese, pulled pork sliders and slow cooked Barossa Valley pork neck. Still hungry? If you have room venture across the road to Swedish Tarts, where you will quickly fall in love with their counter, laden with freshly baked tarts and cinnamon buns. The all-day menu boasts a great range of sweet crepes and traditional breakfast specials like baked omelettes, salmon scrambled eggs and their famous tjockpannkaka – a big fat bacon pancake paired with lingonberry jam. Then work off your lunch with a return ride to Adelaide’s CBD to drop off your bike. 2 p.m. – Shop ’til you drop! For commercial shopping, check out Rundle Mall – Adelaide’s famous pedestrian-only shopping hub. There’s plenty of department stores, cute boutiques and food stalls if you’re feeling hungry! Don’t miss the historic Adelaide Arcade and chocoholic favourite, Haighs Chocolates. Go for a wander along Rundle Street for more independent boutique stores. Rundle Street East is the heart of Adelaide’s cosmopolitan East End District, and just a stone’s throw from the Crowne Plaza Adelaide. Whether you’re looking to clothes shop at Alannah Hill, or shop around for homewares and gifts at Bauhaus or the Urban Cow Studio, Rundle Street has a diverse mix of fashion and retail to meet your every need. Who said secret laneways are only in Melbourne? Detour to some of Adelaide’s most characterful laneways like Ebenezer Place, where you find an eclectic mix of boutique fashion retailers, galleries and some pretty quirky street art! Venture to North Terrace, one of Adelaide’s most famous tree-lined boulevards. Here you will discover the Art Gallery of South Australia, the State Library of South Australia and the University of South Australia’s Samstag Museum of Art. Admission is free to most exhibitions, and you could easily spend hours browsing the unique collection of Australian, Aboriginal and European art. If you have time, pop in to the Museum of South Australia and have a ramble in the Adelaide Botanic Garden (free). The 50 hectares of gardens are just spectacular. Don’t miss the rose garden, Palm House and the Bicentennial Conservatory. Rest your weary legs and venture to 2KW Bar and Restaurant for a cocktail. As far as views go, this is the best bar for it in Adelaide. Have a seat at the terrace bar on the rooftop for sweeping views over the city and some pretty delicious cocktails too. If fine dining is your cup of tea, head to Jock Zonfrillo’s much celebrated Orana. Be prepared for a sensory overload at this intimate dining room, accommodating just 31 diners. Orana offers a seasonal tasting menu that focuses on local and native ingredients. For $175 per person, an epic tasting menu of 18-20 courses is served to diners. Think wattleseed and kangaroo risotto with wild grasses, Coorong mullet, Geraldton wax and watercress and Davidson plum marshmallow and quandong sherbet. If Orana isn’t your cup of tea, or you can’t get a booking, rest assured there are plenty of other options on Rundle Street. Feast on Greek shared plates at Eros Cafe, South African barbeque dishes at Africola, modern Thai cuisine at Golden Boy and some of the best Italian you will find in Australia at Andre’s Cucina and Polenta Bar. There are plenty of wine and cocktail bars in the East End of Adelaide to bar hop well into the evening. For a laid back pub vibe check out the Exeter and The Austral hotels for some great brews and live music, or if you’re looking for a quieter wine bar, venture to the Tasting Room at East End Cellars which offers a diverse array of wines from all over South Australia, in a chic, relaxed setting. You could even treat yourself to a cheese platter while you are at it or participate in a wine tasting flight! Wake up bright and early for breakfast at Redsalt in Crowne Plaza Adelaide. Here you can expect a delicious breakfast buffet, filled with fresh fruit, freshly baked pastries, cereal and an impressive hot selection. The breakfast chef is also on site to make you a hot breakfast of your choice including eggs benedict, French toast and hot cakes, all washed down with a freshly brewed coffee. The perfect way to start the day. Public transport is good in Adelaide but there’s no better way than exploring the Adelaide Hills than with your own car for the ultimate self guided tour. Pop by Adelaide Mini Garage to pick up your wheels for the day. My tip is the Mini Cooper Sports! Only a short drive (approximately 15 minutes) from Adelaide’s CBD is the Penfolds Magill Estate Cellar Door, one of the worlds few urban single vineyards. Boasting beautiful views of the vineyards and Adelaide, there’s no better spot to immerse yourself in the history of Penfolds. As far as Australian wines go, Penfolds is definitely a firm favourite and has taken Australian wine to the world on a grand stage since being established in 1844. A great option for wine lovers is the two-hour Ultimate Penfolds Experience ($150 per person) where you can visit the original home of co-founders Dr Christopher and Mary Penfold, explore some of the hidden tasting rooms and discover the original resting spot of Max Schubert’s ‘hidden Grange.’ The tour concludes with an intimate tasting of some of Penfolds most sought-after wines, in the surrounds of one of Penfolds private tasting rooms. If you have time, pop in to the Magill Estate Kitchen, a casual alternative to the critically acclaimed Magill Estate Restaurant for coffee and cake, or even a cheeky wine! Head up the South Eastern Freeway and detour to Mount Lofty Summit to get a bird’s eye view of the city of Adelaide. From there take the slow road to the Adelaide Hills through quaint villages, vineyards, lush green fields and apple orchards. Wine is definitely a focus here and the Adelaide Hills is one of Australia’s best cool-climate wine regions, home to more than 60 wineries and 48 cellar doors. Sample some local produce along the way, buy some cheese at Udder Delights in Hahndorf or Woodside Cheese Wrights and pick up some juicy apples at the road side apple stalls. The Adelaide Hills is affectionately called “the land of the long lunch” for good reason, you wont want to leave! A great pit stop for a long lunch is the Bird in Hand Winery, nestled in 100 acres of gardens and vineyards. Stop at their cellar door first to try their wines and their world-class olive oil, before taking a peek at their impressive barrel room. space. In winter the fire is roaring, while in summer the sun streams through the open glass. My tip is the signature share-style ‘food flight’ which showcases the best of the changing seasons and local produce (some of it from their very own garden!). And with Chef de Cuisine Carlos Astudillo (ex Magill Estate) at the helm of the kitchen it won’t disappoint! There’s nothing like the taste of fresh strawberries you have picked yourself. Head to family run Beerenberg Strawberry Farm to pick your own strawberries (patch is open November to April). There’s also a farm shop on site stocked with delicious goodies like jams, condiments, chocolates and ice cream. The Paech family have been living on the Beerenberg Farm for seven generations now, so you can feel good about supporting local produce. Relax and rejuvenate in your room with a wine on your balcony and watch the sun set over Adelaide. Enjoy dinner in the comfort of your own hotel at Redsalt, on the ground floor of the Crowne Plaza Adelaide. New chef Akash Srivastava has crafted a delicious modern Australian menu which showcases South Australian produce in all its glory. Think pan seared scallops rubbed with red salt, pan grilled with green pea puree and chorizo and lemon myrtle crusted barramundi with roast fennel puree, confit tomato and lemon caper sauce. For dessert, don’t miss the chocolate indulgence with pistachio crumble, burnt marshmallow and raspberry sorbet. Head to Vaughan Place just off Rundle Street for gin inspired cocktails at The Howling Owl. They stock an impressive 125 varieties of gin from around the world including their very own Kangaroo Island Gins infused with native botanicals. Or if whiskey is your drink of choice, venture to Nola on Ebeneezer Place. With over 75 Australian and American whisk(e)ys, there is something for all whisky, rye, and bourbon enthusiasts. Wrap up your evening with a movie at the Palace Nova on Rundle Street. The breakfast scene is booming in Adelaide at the moment, and one of the best places to get a yummy breakfast is Hey Jupiter. The menu has a French twist with delicious breakfast dishes like baked eggs cocotte, croque monsieur and buttery croissants. If you’re feeling indulgent, top it off with a mimosa or breakfast martini.The alfresco tables outside are the perfect spot to perch on a sunny morning. Oui Oui. Ebenezer Place in Adelaide’s East End has transformed into one of Adelaide’s trendiest coffee hubs. And the whispers on the grapevine say that Exchange Speciality Coffee is one of the best cups you will find in Adelaide. Serving guest espressos as well as beans from Melbourne’s Market Lane, Exchange Coffee have nailed it in the coffee stakes. And the brunch options aren’t bad either! End your trip with one of Endota Spa on Rundle Street for one of their luxurious treatments. Whether you’re looking for a calming massage, or an invigorating facial, you’ll be well looked after here.